… there was a choir. 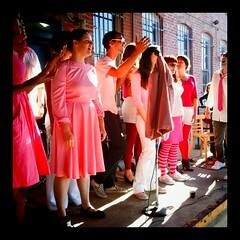 In it, people came together regularly to sing songs of a certain vintage. Some loved the songs for their novelty of arrangement and sense of style, or just for their glorious mouth-feel, appreciative of an especially ornate melodic filigree or a particularly angular rhythmic passage. Some loved the songs for their ability, under the right circumstances, to transport people both backward and forward in time. Some sang the songs aloud when alone or in company to win lovers or amuse acquaintances (or, from time to time, the other way around). From practice to performance, from one side of the bay to another, the songs and the voices that carried them were all that mattered. As time passed, some wandered brief distances away but they could still be heard and answered whenever a call arose on the wind, while others slipped in and out of visibility and even disappeared over the horizon. Still, the songs they sang continued to connect their singers. And so the choir continues to gather and sing to this very day.